Which ASO Tools are the Best? Mobile Action, Sensor Tower, Meatti, App Radar, Priori Data, ASOdesk, Searchman, TheTool, Keyword Tool, AppKeywords.net, Apptentive, Appbot, AppFollow, App Annie, Apptopia, APPlyzer, SplitMetrics, StoreMaven, Raise Metrics, TestNest, SearchAdsHQ, SearchAds by Mobile Action, adAhead, you name it. Like many other things in life, there are no best tools for everybody. But you can find the best tool for yourself based on your requirements. If you are looking for your best ASO tools, check out my findings below. I will first start with a categorization of ASO tools, and follow up with a big list of app store optimization tools. You can then choose your ASO tools based on the category and the details of individual tools. Click here to get a free comparison spreadsheet of all top ASO tools. It can be printed nicely on one page, and you can easily sort the ASO tools by type, price, availability of free version, etc. It also includes 2 more ASO tools that are not covered in this post. ASO tools of this type help you optimize your app keywords to increase your app search traffic. The app keyword related features include app keyword suggestions, keyword optimization, keyword tracking, etc. ASO tools like Mobile Action, Meatti, Sensor Tower, App Radar, Priori Data, ASOdesk, Searchman, TheTool, Keyword Tool, and AppKeywords.net are some good examples. There’s more to ASO than just keyword optimization. Some ASO tools like AppTweak and Meatti provide ASO Report that analyzes your app product page, aka app listing. Based on the analysis, they provide improvement suggestions of your app name, screenshots, localization, pricing, compatibility, etc. The goal is to optimize your product page, which in turn improves your download conversion rate. ASO tools of this type perform optimization of your user reviews and ratings. Tools like Appbot, Apptentive, Mobile Action and TheTool analyze your user ratings and review contents, and tell you what your users like and don’t like. With this kind of sentiment analysis, you can then refine your product development roadmap to earn better ratings. For example, if you find out a lot of users are complaining about a specific issue, you can prioritize your effort to fix that problem, and tell the complaining users about the solution. Many users will appreciate your positive reaction to their comments, and give you better ratings. Related to this, AppFollow provides features that help you reply all comments in App Store and Play Store efficiently. On the other hand, ASO tools like Apptentive help you increase the chance of getting 5-star reviews. It optimizes your app’s rating prompt process by deciding who, when, and how to present your rating prompts. A/B testing enables you to test your mobile app just like a science project. It helps you test two or more app product pages and determine which one gives you a better download conversion rate. Tools like Splitmetrics, Store Maven, TestNest, and RaiseMetrics are some good A/B testing tools for your app product page. These ASO tools help you optimize your advertising campaign on Apple Search Ads. They provide automation features and competitor data that help you run ad campaigns more effectively. Some tools also integrate with app attribution partners (Adjust, AppsFlyer, Kochava, TUNE, etc.) and allows you to optimize campaigns not only for installs, but also for in-app events. ASO tools like SearchAdsHQ, SearchAds by Mobile Action, and adAhead are some good examples. ASO tools of this type provide estimates of competitor performance and app market trends. For instance, they offer estimates on data on competitor apps. These estimates include app downloads, revenue, advertising spend trends, market penetrations, etc. The information can be useful to app product managers and marketing managers for doing competitive analysis and marketing planning. App Annie, Mobile Action, Sensor Tower, Priori Data, Apptopia, and APPlyzer are ASO tools that offer app store intelligence. Listed below are the top ASO tools in 2018. The list is organized according to the types of ASO tools discussed above. To make the list more authentic, I personally reached out to everyone of them and collect their views of how their tools can help their users. And I’m fortunate enough to receive some great answers! Lastly, I’ve prepared an one-page comparison spreadsheet with all the ASO tools. It is a printable version, and you can easily sort the ASO tools by type, price, availability of free version, etc. Meatti helps mobile app developers boost app downloads without the need of any ASO experience. Our tool uses artificial intelligence (AI) to perform the jobs of an ASO consultant, and provides app developers with the best keyword and optimization suggestions week after week. Mobile Action is an intuitive App Store Optimization tool and a data company providing actionable insights for their users. It provides its users with the most accurate data possible but that’s what every ASO tool claims to do. In fact the difference of Mobile Action is its dedicated customer success team that provides instant support across the entire globe 24/7. Mobile Action got into business as a ASO agency so we know a great deal of stuff regarding App Store Optimization and we build our tools from the perspective of an ASO specialist. Sensor Tower provides mobile developers with powerful market intelligence and App Store Optimization solutions that enable them to easily surface competitive insights and achieve maximum organic growth on the App Store and Google Play. App Radar is an search engine optimization tool that helps app developers optimizing their apps being more visible within the app stores. With a direct integration into iTunes Connect & Google Play Console, App Radar makes the process of App Store Optimization easy like never before. Priori Data App Intelligence enables you to research, benchmark, and track your competition all in one place. Create individual or team viewable watchlists and comparisons of apps in your competitive set, and track their rank, download, revenue, DAU, MAU, ARPDAU and retention performance on a daily basis. Set up smart alerts to get notified of any major shifts, and receive daily and weekly reports so that you never lose track of the big picture. Our dream is to make our customers more and more successful. App Store Optimization is a never-ending optimization process that can bring millions of free installs. Our clients have many opportunities to make their business more effective. Just in a couple of clicks our product is available for you and ready to help you to find new real users. TheTool helps developers and marketers to track and optimize their App Store Optimization strategy in 91 countries or globally, carry out keyword research, benchmark ASO KPIs with competitors, understand the impact of marketing actions on installs, conversion rate and revenue; and, ultimately, grow the organic installs of their apps and games. Basically we help people make more money with apps. KeywordTool.io helps marketers and app creators discover what app store users are looking for by generating keyword suggestions using the app store’s autocomplete. A simple search can yield hundreds of hidden keywords for you to optimize your app towards. When I launched AppKeywords.net back in 2015 it was really hard to get proper data on keywords. Sure you had a lot tools giving you some kind of estimates but you could not be really sure if the data is accurate. Especially when you were researching non-english keywords. Using proactive mobile communication tools, Apptentive empowers companies to better understand more of their customers—at scale—in order to drive app downloads, create seamless customer experiences, and validate product roadmaps. The product gives brands the opportunity to listen to, engage with, and retain their customers through intelligently timed surveys, messages, and prompts. They power millions of customer interactions every month for companies including Buffalo Wild Wings, eBay, Philips, Saks Fifth Avenue, and Zillow. Appbot helps developers understand how customers feel about their apps, by monitoring and analyzing their app reviews and ratings across all major platforms. Appbot applies proprietary sentiment analysis and clustering techniques to help developers understand current issues, and identify quick wins. AppFollow is created to support everyone (this year we will expand this support even further) involved in the process of development and growth of mobile apps and games. We support everyone whether it is a developer, CEO, customer support or product manager, ASO expert or publisher. The industry’s first app data platform integrates your app data with our comprehensive market data, cutting-edge data science, deep data foundation and engaging data experience. Through our platform, you can get immediate access to all our latest technology innovations and data sets, share the right data with the right people at the right time, pinpoint prime opportunities — and most crucially — create winning strategies. Apptopia provides competitive intelligence for the mobile app economy. Through intuitive tools, we’re able to display actionable data. This means user acquisition managers, product teams, SDK sales teams, growth marketers and more can make smarter decisions faster. Data we provide includes downloads, revenue, usage, retention, rank, SDK data, audience intelligence, advertising intelligence and more. With SplitMetrics, such app publishers as Rovio, Halfbrick, Wargaming, ZeptoLab, Pocket Gems optimize app store conversions by A/B testing app page elements: from icons and screenshots to subtitles, app previews, etc. To help publishers get the most out of their app marketing efforts, SplitMetrics shares industry benchmarks and a great volume of educational materials, such as an AppGrowthLab course. StoreMaven helps more than 60% of top-grossing app publishers optimize their app store product pages to increase install rates and reduce the cost of user acquisition. Companies like Google, Uber, Facebook and Zynga rely on StoreMaven‘s testing and analytics platform to define their ASO and global mobile marketing strategies. Insight Is Everything. 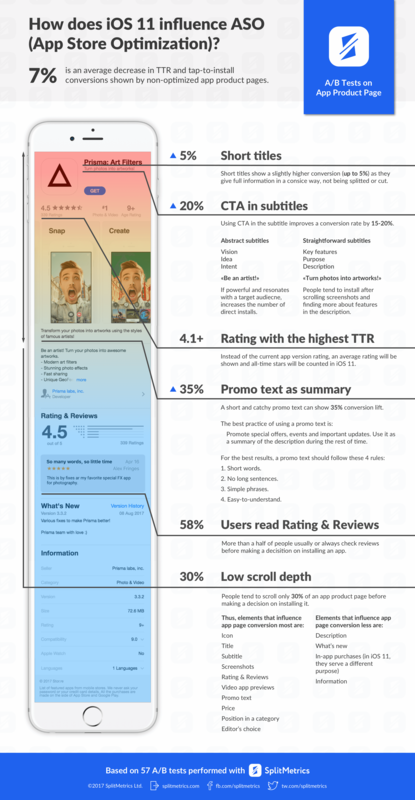 RaiseMetrics provides a visual understanding of how your audience interacts with your app page, and what you can do to maximize conversions. Best self-serve app store and google play ab testing platform. Unoptimized App Store pages may increase CPIs by up to 40%. A/B test your app listing pages and get more quality users for less. Learn from user behavior analysis make optimized data-driven decisions. SearchAdsHQ helps app publishers run ROI-driven Apple Search Ads campaigns. To make it possible, the platform connects Apple Search Ads with app attribution partners (Adjust, AppsFlyer, Kochava, TUNE, etc.) and allows to optimize campaigns not only for installs, but for in-app events: in-app purchases, subscriptions, conversions. Mobile Action provides awesome tools to make the most of your Search Ads and keep up with the competition. Searchads.com was created specifically for Apple Search Ads and as Apple Search Ads is a rather new service it tries to cover the shortcomings of Apple Search Ads by providing competitor data, more reactive notifications and automation features that allows users to get the most out of the time and resources they have spent in Apple Search Ads. adAhead is an Apple Search Ads Optimization Platform that is fully self-managed by mobile app marketers. It provides GEO reports, COHORT analysis, keyword reports and charts, powerful rule manager tool, keyword rank monitoring, custom ad scheduler, bulk edit, duplication option for campaigns/ad groups, and multi account dashboard. adAhead also provides fully featured live demo for new visitors. The list of ASO tools here is really long. To make it easier to do comparison, I've prepared an one-page comparison spreadsheet with all the ASO tools for you. The spreadsheet also includes 2 bonus tools and additional details that I didn’t have room to include in this post. Do you want to boost your mobile app downloads for free? Read these 40 App Store SEO tips! You’ve put in a lot of hard work to make a great mobile app, and published it in the app stores. It’s time to get people to download and use your app. After all, if you don’t care about it, who will? To help you get started, I’ve put together a list of 40 App Store SEO tips to boost app downloads. But wait, what is App Store SEO? App Store SEO is the process of optimizing mobile apps for the purpose of achieving a higher rank in the app store search results and top charts rankings. Due to its similarities to search engine optimization (SEO) for websites, App Store SEO is also referred to as App Store Optimization (ASO), App Search Optimization, and Mobile App SEO. From our case study, App Store SEO helped boost app downloads by 1478% in less than a month! Click here to get a free summary checklist of all app store SEO tips in this post (the checklist also includes 2 bonus strategies and additional details not covered in this post). You don’t need to spend a penny to do most of these tips! Okay, let’s dive right in! Note: If you find the tips below useful, remember to get the summary checklist here. According to research by MobileDevHQ (now renamed Tune), using keywords in your title can result in up to a 10.3% boost in rankings. Both Google and Apple’s search algorithms scan the app name for keywords when a user performs a keyword search in the app markets. And both platforms give quite high priorities to apps with app names that contain the search input. So it is a good idea to include a few keywords in your app name as an App Store SEO practice. But don’t stuff every keyword into your title or your app will look spammy. You need to find a good balance between keywords and branding. But how? Read on! Keep the actual brand name short and sweet. You can then append this short brand name with a few keywords, typically preceded by a dash or a semicolon. Use the format “Brand Name – Keywords” or “Brand Name: Keywords” to include relevant keywords in your name. Use this tool to analyze your app name and get the recommendations of best name format and length. It’s also important to use only URL-friendly characters in your title, particularly in the App Store. It is because Apple uses the app name to create your app URL. Also, avoid any special characters in your app name, like the trademark or copyright symbol. They will cause iTunes to refer to your app’s numeric ID to scan for relevant keywords instead of your app name. iOS App Store: Apple limits the app name to a maximum of 30 characters in iOS 11. So you have to make good use of every character in your app name. Brand Name: Use 23 characters or less for optimal presentation on every device. Total Length: To make the most of the 30 character limit, use more than 20 characters to include a few relevant app store keywords after your brand name. Google Play Store: App name in Google Play Store is limited to 50 characters. Again, use a short and sweet brand name. If you also have an iOS version, use a consistent brand name, and use the remaining space to include a few app store keywords to boost your search exposure. iOS App Store: This field is introduced in iOS 11 and available in the iOS App Store only. App subtitle appears under your app name, and is limited to 30 characters only. It is ideal to include some keywords in this field to communicate the value of your app. More importantly, the keywords in your subtitle will be indexed in app store search. So be sure to make good use of this precious field to cover some important keywords. iOS App Store does not search for keywords in the app description, but that does not mean iOS developers can be lazy with it. Read the next sections below for more tips about App Description. The Google Play Store provides you with a short description field (up to 80 characters) and a long description field (up to 4,000 characters) to describe your app. More importantly, Google indexes words in both these two description fields to become your app store search keywords. By repeating your most important keywords up to 5 times in your description fields, you tell the Google Play algorithm that your app is most relevant to those keywords. In Play Store, you are encouraged to repeat important keywords throughout App Title and Description (Short and Long) up to 5 times. However, in App Store, repeating keywords in App Title, Subtitle and Keyword fields is considered a waste of precious keyword space. Also, Play Store allows rich formatting (HTML) and emoji in your app description. As in the regular web page SEO, you can use <h1>, <h2>, and <h3> header tags as well as <b>, <i>, and <u> style tags to emphasize the most important keywords to Google. That said, it’s important to incorporate keywords into the description in natural and sensible sentences. Use bulleted lists and paragraphs to make it easy-to-read. According to StoreMaven, only an average of 5% users will click the “read more” button below the short description on Google Play. This number is further down to only 2% on Apple’s App Store. So every character in the short description counts! On mobile, you only have 252 characters for this short description. You don’t want to waste any space here. Make it concise and attention-grabbing. Avoid blank lines and interrupted sentences. Tell users what makes your app unique and why they will love it. Focus on your app’s values, instead of features. And don’t forget to include a call-to-action text to get the users excited! Highlight the features of your app here. Use spacing and bulleted lists to make it easy to read. If possible, also list out all the social proofs, awards, and honorable mentions your app has received. Don’t forget to include your app’s social media links too. Also, Google Play Store allows rich formatting and emoji in your app description. Make good use of these to make your description organized and stand out from the crowd. Communicate in the tone of your brand. Use terminology your target audience will appreciate and understand. 90% of top 100 apps use less than 3385 characters. Though app description length doesn’t have a very big impact compared to other factors, it is still a good idea to keep your length within this range. Do you want to know the latest statistics of description length? Just use this App Store SEO tool. The tool benchmarks your app with the top 100 apps and tells you how to improve. Your app’s promotional text appears at the top of the description and is limited to 170 characters. Though the promotional text is NOT indexed in the app store search, the good news is you can change this text anytime without releasing a new version. You can use this promotional text to do A/B test of different messages quickly without doing a version update. Once you’ve found the message that gives you the best conversion rate, you can then turn the contents of the message into your app store keywords. A better icon can boost your downloads up to 560%! To design a good icon, keep your design simple and eye-catchy. Do not cram the small space with many items or words. You want people to remember the icon after the first impression. Also, make sure your icon will still look good when it is scaled down to the smallest size required by App Store / Google Play. It should also look good against light and dark background. To get more design inspirations, browse the top-rated apps in your category and Apple/Google’s top picks. Also, make sure your icon is different from your competitor’s to avoid brand confusion. Contrasting colors, different shapes or adding a frame can also help. If your app has an established brand, use the logo to make your brand and your future products recognizable. If your app is a functional app, use one object to describe your app. To begin with, try and come up with at least 50 keywords. Here are some great ASO tools that help you with the app store keyword ideas. These tools will then give you many keyword ideas to consider. And they are all free! Remember that your keywords must be relevant to your app. Don’t be tempted to use a keyword just because it is popular, but not relevant to your app. You want your app to be found by users who will really download and enjoy your app. Let’s illustrate the idea by an example: using “Rio” and its related keywords during the Olympics 2016 would greatly help the exposure of your sports apps. Your app would also have a better chance to get into the app store’s feature lists too. Did you know the words in your app user reviews are indexed by the app store search engine? That is why review analysis is a very good way for getting app store keyword ideas. Your app reviews speak your users’ mind. And the words are highly related to how they would search for your app. Just by looking at your review keywords, you will be surprised to find out the keyword ideas that you have never thought of before. There are some review analysis tools in the market. And this one uses Artificial Intelligence on your user reviews to find out what your users like and don’t like about your app. With your initial set of app store keywords, you have to pick a strategy on how to optimize the right keywords. There are some keyword research tools that help you with this app store keyword optimization process. These tools provide the popularities (or search traffic) as well as difficulties (or chances) of your app store keywords. In general, carefully select around 25 app store keywords for the next release of your app. For a new app, choose the app store keywords with low difficulty and reasonable popularity. They help your app gain the initial momentum. After gaining the initial momentum, start using app store keywords with higher popularity and reasonable difficulty. They help your app stack up more downloads. Work your way up gradually as your app gets more popular. If you don’t know what difficulty and popularity you should use for your keywords, use this tool that makes the decision for you using AI. Use longer keyword phrases (aka long-tail keywords) to outrank the competition. For example, it is hard to outrank Zynga Poker by the competitive keyword “Poker” (high difficulty). But you have a better chance to outrank it by the keyword phrase “Poker Casino”. It is because “Poker Casino” is less competitive (lower difficulty). You can multiply the character space to store your app store keywords using this trick. That means you can use up to 500 characters to store your keywords for getting a lot more app store search traffic! If you have already released your app with your target keywords, check your current app ranking of these keywords. Keep those keywords that your app ranks within top 10, and replace the rest with new keywords in your next release. Now that you have chosen the keywords, you are ready to use them for your app. For iOS developers: Fill in the keyword metadata with your selected app store keywords. This metadata decides how your app gets discovered. Follow the rules below and make every character counts! No need to include the words in your company name, app name and app category names. You can use the App Store SEO Grader to optimize your app keyword metadata. The tool applies the above rules to your app keywords and tells you how to improve. Do you want more keyword space for your iOS app? You can get up to 500 characters for your iOS app store keywords using this optimization tip. That is FIVE TIMES more! For Android developers: Google Play doesn’t have the keyword metadata. Instead, Google pulls keywords from your description to be your app store keywords. Incorporate your keywords in the description in natural and sensible sentences. Note that keywords in the above-the-fold section (the first few lines) carries more weight than the rest of the description copy in Google’s ranking algorithm, so remember to put your main app store keywords in this section. Both Apple and Google index the names of in-app purchases (IAP) in the app store search. And in iOS 11, each IAP has its own display name, promotional image, and description. In-app purchases can also appear in search results and be featured on the Today, Games, and Apps tabs. You can display a maximum of 20 IAPs on your product page. To maximize your search exposure, be creative and include some app store keywords in the names of your IAP items. According to StoreMaven, 60% of users won’t swipe past your first two screenshot images. A better version of your first two screenshots can boost your conversions by 25%! To make great screenshots, make sure each screenshot is telling a single message about your app. Show your strongest messages in the first two screenshots. The best apps use all five screenshot slots to impress their users, and you should do the same. Adding short caption texts on your screenshots can help, but make sure they are on a clean background. And try to create a positive impression in the viewers’ mind at all times. Avoid login, registrations, purchase forms, ads and even “Welcome” screen in your screenshots. Make the best use of the screenshots to tell your users why they should love your app. Keep the screenshots vertical. The users can see more screenshots on the narrow screens when the screenshots are vertical. To optimize your app screenshots, use this tool checks your screenshots’ dimensions, count, orientations, and their compatibility with various iOS devices, and tells you how to improve. Making a video may be difficult but it can boost install rates by more than 23% according to StoreMaven. Don’t forget to use a good poster frame (iOS) / feature graphic (Google Play). This graphic has a big impact to whether your visitors would watch your video. Remember, 80% of users don’t watch past first 12 seconds of the video. Do make sure you keep it short and to the point. Avoid any fade-in and “welcome” type of message at the beginning of your video. In the search result page of iOS 11, up to three App Preview videos and/or screenshots can appear, rather than just two as in iOS 10. Videos will always be displayed before screenshots and the first video will now play automatically, but the sound will be muted by default. Ratings and reviews have a great impact on your app downloads. You need an average rating of 4-stars or above. Or else only less than 50% users are willing to download your app. Use this tool to get a user sentiment analysis of your app. It applies artificial intelligence on your user reviews to find out what your users like and don’t like about your app. How can you get more five-star ratings for your app? Delay asking for a rating until there’s a likely moment of constructive feedback. For instance, ask when the user completed a reservation, finished a mission in a game, etc. When the time comes, ask nicely, and don’t beg. The key is to encourage satisfied users to leave positive reviews and deflect negative reviews by using a “send feedback” option. Since the released of iOS 10.3, you can only ask a user for an app rating three times per year. To make the most of these scarce rating opportunities, you should first identify your app lovers, and then ask them for ratings at the right time. You can do so by some simple surveys or dialogs. Those who respond with a score of 9 to 10 are your “Promoters”, or app lovers. And they are likely to give you 4 to 5-star ratings when you later ask them for app ratings at the right time. To do this, you can either develop your own version of rating and feedback flow or simply use the tools like Apptentive. Direct only positive reviews to App Store, and negative reviews to support. But what if I already have many bad reviews? Luckily in iOS 11, you can decide when to reset the average ratings and start over with a clean slate. In iOS 10 or before, you can use these tips about how to sweep bad reviews under the rug. He also tells you how to give a positive first impression about your app by making good use of the five-star reviews. Remember to reply the app reviews and feedback! Only the ones who care about your app will spend the time to leave a comment. Show them you care about them as well! This is a great way to let the visitors know that the developer is active too. For Google Play, there is a “Reply to a review” option in Developer Console for you to do just that. For Apple App Store, you can also do this since iOS 10.3 release in March 2017. On iTunes Connect, go to ‘My Apps > Choose your app > Activity > Ratings and Reviews’. There you can see the “Reply” option in each of the reviews. Try to reply to all feedback immediately following a major release of your app. If you can’t respond to every review, try prioritizing reviews with the lowest star ratings or those mentioning technical issues with the most current version of your app. When you release an app update that fixes issues users mentioned in older reviews, consider replying to the relevant reviews to let them know that your update addressed their concerns. Once a user indicates that your response answered their question or fixed their technical issue, consider asking them to update their rating and review. You can also foster deeper engagement by asking users for feedback on future app updates as part of your reply. One-star reviews are your friends. Read them all. Try to understand why the users complained your app, and think about what you need to do to turn them into five-star reviews. This thought process helps you improve your app from the user perspective. Also, fix all serious bugs, crashes and performance issues. In the end getting more and better app reviews comes down to creating a great app users love. Listen, improve your apps and repeat until you are topping the app store ratings. App localization gives you a larger audience to download your mobile app. But localizing the whole app to many languages can be a daunting task. Before doing a full localization of your whole app, consider localizing your app listing first. It means translating your app name, keywords, screenshots, etc. According to OneSky, only 31% of the world’s total app revenue came from the U.S., while 41% came from Asia, and 23% came from Europe. In particular, China has already surpassed the U.S. by both iOS app download and revenue. If your app only has an English version for the U.S. market, you are leaving a lot of money on the table. Localize your app listing first to see how well your app performs in different countries. You can then decide if you should perform full localization of the whole app for the best performing countries. Different countries have distinct preference of icon colors, screenshot layouts and annotations. Check out these posts about icon colors and screenshot localization for more insights. Now you know the strategy, but which countries should you start first? If your app is already available in more than one country, you can use app analytics to find out the top countries by your app downloads. Check the official languages of the top five countries, and localize your app listing if you haven’t done so. Depending on your priority, you can also do the same using top countries by revenue, ARPU, conversion rate, active devices or retention. This tool predicts where your next successful markets are based on ARPU (Average Revenue Per User), Conversion Rates, and more. With this information, you can proactively localize your app to grasp the market opportunities. Another approach is to localize your app listing for the top countries by downloads and/or revenue in the world. According to App Annie, here are the top countries in Q3 2016. Again, check the official languages of the top countries, and localize your app listing if you haven’t done so. Apple’s Spotlight Search allows users to search for their iOS apps installed on their device. This feature helps app developers engage existing users more frequently. For iOS app developers, enable Core Spotlight and NSUserActivity for your app. They improve your user engagement, which in turn improves your iOS app store search ranking. In fact, 35% of top 20,000 apps on the iOS App Store have Spotlight search enabled. What are you waiting for? Google’s Firebase App Indexing allows users to search the dynamic content in your app, and it works for both Android and iOS devices. Firebase App Indexing not only helps improve your user engagement, it is also a user acquisition opportunity. It is because it allows users to search for your app contents no matter your app is installed or not. If you have a content-rich app, you should enable Firebase App Indexing to make to most of these opportunities. See the official documentation here. First, what is conversion rates (CR)? Let’s use the analytics from Apple App Store to illustrate the concept. The page view CR is the percentage of people who see your app from search results, rank lists, or featured app lists, and then tap the icon to check out your app. The download CR is the percentage of people who visit your app page and then download your app. These two CRs can be presented along with impressions, product page views, and app units in a diagram called Conversion Funnel in-app marketing. Why is conversion rate such a big deal? There are mainly three reasons. Keyword ranking and number of downloads are not the best metrics to measure the performance of App Store SEO. There are many external factors that can influence those two metrics. For example, a big competing publisher may publish a hugely popular app and shift the apps in the keyword ranking by a margin (e.g. The impact of Pokemon Go and related apps on the keyword “Pokemon” and “Go”). Or you run App Store SEO and an advertisement campaign at the same time and the number of the downloads become not purely organic. On the other hand, CRs are independent of market competition nor the source of traffic. They give you the true picture of App Store SEO effectiveness. and place the app in a dominant spot (i.e. rank or featured list). 3. CR saves you money! It’s just simple math: if you double your CR, you cut your advertising cost by half for the same amount of downloads. For the same reason, if you haven’t optimized your CR, don’t spend big bucks on advertising campaigns! You would be wasting your money. Just a side story: some ranking manipulation farms even go far and take advantage of this. They offer keyword-rank-manipulation service. They boost the ranking of an app by “searching” the app by specific keywords, tapping the app in the search results and download the app — the exact flow of conversion funnel. Now you know the importance of conversion rate, let’s see how we can improve them. If Page View CR is less than 3%, you should try to improve it. 3%? Really? Yes, 3% sounds very low, but you won’t believe many apps have less than 1% we have seen! It is because the app search result only shows these pieces of information. That means they are your baits to bring users to your app page. So make good use of them! Based on this graph, you should set your download CR target to at least 60% for most categories. For Health & Fitness and Education categories, you may set your target a bit lower to around 40% and 50% respectively. If your download CR is lower than the target benchmark, you should follow all tips in this article to improve this metric. Use this tool to benchmark your app’s conversion rate (CR). It compares your download CR with your app category’s median and best CR, and tells you what you should do. Try to make your app smaller than 150MB for iOS app, or 100MB for Google Play app. It is because users cannot download apps that are bigger than these sizes using cellular service. So for example, if a user on a bus or a train can’t download “now”, it is unlikely the user will write down the name and try again X hours later when they’re home. Need some proof? This post from appfigures shows that ~98% of the top 100 free and ~62% of paid iOS and Android games are under 100MB. Do you think 100MB is not enough for your app? Take a look at Clash of Clans. Its iOS version is just 85.3 MB. To reduce the app size, consider compressing some of the graphical assets or make some of the contents downloadable after install. Do you want to know how your app size compares to that of the top 100 apps? Use this tool to see whether your app size falls in the reasonable app size range of the top 100 apps. Making your app free can remove the friction for users to download your app. After all, what price is better than free? If you want to make money from your free app, consider In-App Purchase (IAP) pricing model if that makes sense to your app design. IAP account for 79% of app store revenue. New to In-App Purchase (IAP)? Check out this Do’s and Don’ts IAP Checklist. It can jump start your IAP design. Need In-App Purchase (IAP) Ideas? Here is a wonderful list of 40 IAP ideas for you to consider. If you choose to make in-app advertising revenue, try to use native ads. They are created to fit the exact context of the app they appear on. This way, they serve as extra content for the app itself rather than a piece of promotional materials. Check out this post to see more reasons why native ads are better than traditional banner ads. Use a reasonable price by comparing your app price with your competing apps. Also, take reference of the price range of the top apps in your app categories. A good starting price point to test the market is $0.99 or $1.99. Anything above $2.99 won’t make you a lot of money. The exception is Minecraft Pocket Edition, which is priced at $6.99. For iOS apps, supporting iMessage App helps your app grow viral through the user’s phone contacts. You can also gain extra exposure in the App Store for iMessage. Need ideas of how to use iMessage for your app? Check out how these 10 apps make use of iMessage integration for more ideas. For iOS apps, supporting Apple Watch improves your app’s customer experience and user loyalty. But don’t just copy your original app features directly to your Apple Watch app. Make good use of the Apple Watch characteristics to improve your user experience. Need inspirations? Check out these 50 best Apple Watch apps. For iOS apps, Apple offers the Family Sharing opt-in for app developers. Family Sharing allows up to six family members to share app purchases on the same credit card across devices and parents to supervise their children purchases. Supporting Family Sharing means you can reach more family members and improves user loyalty. Apple also clarifies that in-app purchases are not transferable through Family Sharing. It means Family Sharing gives higher revenue potential for apps with in-app purchases. These features improve your game’s virality and user retention in many ways. Statistics show that there is a high correlation between high ratings and app update frequency. In fact, releasing regular updates has many benefits. It improves user loyalty and keeps an app top of mind because your app will show up in the updates list in the app stores. Apple and Google also like to see app updates because they show you’re committed to the app and that it’s still being maintained. For these 25 top iOS apps, the average was about 30 days between updates. I’d recommend at least an update a month, and up to once a week. Don’t forget to use push notifications to alert users to new app updates. They have a big impact on your update downloads. Ideally, you should only send notifications to the users who haven’t downloaded your latest version. In case you can’t distinguish who have and who haven’t, you should word your message carefully to avoid the confusion. Hey! Have you checked for updates in the App Store recently? Updates! Are all your apps up to date? Check the Updates button in the App Store. Of course, you shouldn’t do an update just for the sake of doing an update. Your updates should always improve your app in some ways, either by bug fixings or enhancements. Here is a cool infographic produced by Y Media Labs. It sums up the most important points about App Store SEO. Do you want to learn more about app marketing strategies? Check out The Essential List of 35 App Promotion & Marketing Strategies. It covers many app marketing topics such as PR, brand building, and marketing through social media, community, and other online channels. After you have published the changes, keep an eye on the keyword rankings. The rankings change right after you published the new version. Target to make your app rank within top 10 of all keywords. If your new keywords are too hard to rank, you might have to replace them with your old keywords. Review your App Store SEO every three weeks or four because that is when big trends of app ranking change. Don’t give up if the results of first few optimizations are not turning out well. App marketing takes time and App Store SEO needs many observations to master. You’ve read to the end of this mega post (6,000+ words). Give yourself a BIG hand! Now it’s time to apply what you’ve learned. Click here to get a free summary checklist of all app store optimization tips in this post, and apply them to your app. The checklist also includes 2 bonus strategies and additional details that I didn’t have room to include in this post. Did you know you could 4X your iOS App Store keywords to get more traffic? That means you can use up to 400 characters to store your keywords for getting a lot more app store search traffic! YES, 4 X 100 = 400 CHARACTERS! Just follow this app store keyword optimization guide to find out how. How Do App Store Keywords Work in the App Store? Apple App Store actually indexes multiple app localizations in each App Store market. It is because App Store users use different languages in each market. For example, the U.S. App Store indexes BOTH English (U.S.) and Spanish (Mexico) localizations. Because of that, users of the U.S. App Store can search for an app using the keywords in both localizations. So if you publish your mobile app to the U.S. App Store, you can use the 100 keyword character space in BOTH English (U.S.) and Spanish (Mexico) localizations. A total of 200 character space. A double up! In the Spanish localization, you can enter Spanish keywords. Or if you prefer, you can also enter English keywords there too. Click here to get a free list of all countries in the world that you can apply the trick above. The list also shows you what additional localizations you could use in each App Store market to store extra keywords. You can apply the same localization tactic to the app name field to include more keywords. As mentioned in our App Store SEO Tips and App Store Optimization Tips, keywords in the app name carry more weight than in the keyword field when it comes to app store search ranking. By using this trick, you will have a big advantage over your competition. This App Store keyword optimization technique works not just in the U.S. market. It works in all App Store markets in the world. This way, you can easily double the space available for your App Store keywords in English or any other language you prefer. All you need to know are the localization languages that are indexed by your target App Store market. Which App Localizations Should I Use? App Store indexes at least two app localizations in each App Store market. And some markets have even more! For instance, Switzerland App Store indexes four localizations: German, French, Italian, and English (U.K.). That means you can 4x your app store keywords in Switzerland App Store. But how about the other App Store markets? To save you time, we have compiled the app localizations indexed by every App Store markets in the world. Click here to get the free list of all countries that you can apply this trick. Remember: once Apple has approved your new app store keywords and localizations, go check your new app store keyword rankings. As a rule of thumb, make sure all your target app store keyword rankings are less than ten. Now you have a lot more space to store your app store keywords. But what keywords should you use in this extra space? App Store Optimization (ASO) is the process of optimizing mobile apps for the purpose of achieving a higher rank in the app store search results and top charts rankings. Due to its similarities to search engine optimization (SEO) for websites, app store optimization is also referred to as App Store SEO, App Search Optimization, and Mobile App SEO. When I launched my first app in the app stores a few years back, I thought the app was so awesome that it would get a lot of downloads. Well, in actuality, the opposite happened – there were only a few downloads each day. Frustrated, I turned to paid advertisement campaigns. But the cost-per-install of an advertising campaign can easily cost you US$1 to US$5. In addition, you need at least 40k installs per day to get to the top 25. However, all is not lost. Through countless hours of hard work and research, I learned many techniques to “get my app off the ground”. For the sake of brevity, I will mention the strategy that was the most quintessential to my then-future success … app store optimization. At last, I managed to increase the amount of the app downloads by 1478% in a month! Click here to get a free summary checklist of all app store optimization tips in this post (the checklist also includes 2 bonus strategies and additional details not covered in this post). How to do App Store Optimization? One of the biggest aspects of improving your app store search rankings is the choice of keywords. Thus, your app search optimization efforts should start from implementing the right app store keywords. To start, try and come up with at least 50 app store keywords. Here are some great ASO tools to guide you through the hunt for quality keywords. These tools will provide you many other keywords to consider. And the best part of all – they’re all free! Remember that your app store keywords must be relevant to your apps. Don’t be tempted to use a popular, but irrelevant keyword to your apps. You want your apps to be found by users who will actually download and enjoy your apps. This is why review mining is a very good method for getting app store keyword ideas. In addition, app reviews are an extension of the users’ minds and the words within the reviews are highly related to the things users would look for in an app. You will be surprised by the amount of keywords you might discover just by observing app reviews! There are review analysis tools on the market you can use to identify keywords from app reviews, and this one uses Artificial Intelligence on your user reviews to identify what your users like and don’t like about your app. Let’s illustrate the idea by an example. If you had used the word, “Rio” (the city, not the movie) in conjunction with its related app store keywords during the 2016 Olympics, you would have definitely received greater exposure for your sports app. Now with your initial set of app store keywords, it’s imperative you develop a strategy to filter and select the best keywords for your app. Here are some app store keyword tools that can help you with this optimization process. These tools provide the popularities (or search traffic) as well as difficulties (or chances) of your app store keywords. In general, carefully select around 25 app store keywords for the next release of your app. Use longer app store keyword phrases (i.e. long-tail keywords) to outrank the competition. For example, it is hard to outrank Zynga Poker by the competitive keyword “Poker” (high difficulty). However, you would have a better chance to outrank it by utilizing keyword phrases such as, “Poker Casino”. This is because “Poker Casino” is less competitive (lower difficulty). If you have already released your app with your target app store keywords, check your current app store keyword ranking. Keep those app store keywords that your app ranks within top 10, and replace the rest with new keywords in your next release. Now that you have chosen and optimized your app store keywords, you are ready for step 2 of app search optimization: putting the app store keywords in the right places. There are a couple of metadata where you must fill in the text with your app store keywords. Name your app in a creative and searchable fashion. Not only is it the first piece of the puzzle in telling your potential users what your app is, it also gets your app in the app store search results. According to MobileDevHQ (now renamed to Tune), using keywords in your title can result in up to 10.3% increase of rankings. Both Google Play and iOS App Store search algorithms scan the app name for keywords when a user performs an app store search and give higher priority to apps with names that contain the search input. As such, it is a good idea to include a few keywords in your app name. However, moderation is key. Don’t stuff every app store keyword you know into your title or your app will look spammy. You need to find a good balance between keywords and branding. Also, iOS App Store limits the app name to a maximum of 30 characters in iOS 11, while Google Play Store sets the limit at 50 characters. Thus, efficiency and moderation is the name of the game. It’s also important to use only URL-friendly characters in your title, particularly in the App Store, as the iOS uses the app name to create your app URL. Also, avoid any special characters in your app name, like the trademark or copyright symbol. They will cause iTunes to refer to your app’s numeric ID to scan for relevant app store keywords instead of your app name. App subtitles were introduced in iOS 11, available in the Apple App Store only. This field appears under your app name and is limited to 30 characters only. It is ideal to include some keywords in this field to communicate the value of your app. More importantly, the contents of your subtitle will be indexed in app store search, so be sure to make good use of the app subtitle to cover important keywords. The iOS App Store does not search for app store keywords in the app description, but that does not mean iOS developers can be lazy with it. You should mention the unique values – the provided benefits of the app – in the first three lines so that visitors can catch them easily from the description preview. If possible, list out all the social proofs, awards, and honorable mentions your app has received. Try to compile the list of complete features in the description box for new visitors, and don’t forget to include your app’s social media links. This number is even lower on the iOS App Store, clocking in at only 2%. This means that every character in the short description counts! You don’t want to waste any space here. Avoid blank lines and interrupted sentences. Tell users what makes your app unique and why they will love it. Add a strong call-to-action text to encourage visitors to install your app. Like the app subtitle field, the app promotional text was introduced in iOS 11. It is situated at the top of the description and is limited to only 170 characters. Though the promotional text is NOT indexed in the app store search, you can change this text anytime without releasing a new version. You can use the promotional text to perform an A/B test of different messages quickly without publishing a version update. Once you’ve found the message that gives you the best conversion rate, you can then input the contents of the message into your app store keywords. This metadata decides how your app gets discovered. Fill in the keyword metadata with your selected app store keywords. Follow the rules below and make each character count! No need to include the words of your company name, app name, and app category names. You can use the App Store SEO Grader to optimize your app store keyword metadata. The tool applies the above rules to your app store keywords and informs you on techniques to improve. Do you want more app store keyword space for your iOS app? You can get up to 500 characters for your iOS app store keywords using this optimization tip. That’s FIVE TIMES more than before! And in iOS 11, each IAP has its own display name, promotional image, and description. In-app purchases can also appear in app search results and be featured on the Today, Games, and Apps tabs. You can display a maximum of 20 IAPs on your product page. To maximize your app store search exposure, be creative and include some app store keywords in the names of your IAP items. After app store keyword optimization, optimizing the app store page is the next core step of ASO. The first goal of app search optimization is to increase the app installs. To this end, the app detail page has to be persuasive enough to convert the app store page visitors to app users. A better icon can increase your downloads up to 560%! To design a good icon, keep your design simple and eye-catching. Do not cram the small space with many items or words. You want people to remember the icon after the first impression, so simple designs without much noise is best. Also, make sure your icon will still look good when it is scaled down to the smallest size required by App Store/Google Play. It should also look good against light and dark backgrounds. To get inspiration for designs, browse the top-rated apps in your category and Apple/Google’s top picks. Also, make sure your icon is different from your competitor’s to avoid brand confusion. Contrasting colors, different shapes, or the addition of a frame can also help. If your app is a functional app, use one object to describe your app. If your app has an established brand, use the logo to make your brand and your future products recognizable. Use the science of colors in designing your icon. The color scheme should align with the message that you want your brand to convey. According to StoreMaven, 60% of users won’t swipe past your first two screenshot images. Using your two best screenshots can increase your conversions by 25%! To produce better screenshots, make sure each screenshot is telling a single message about your app. Display your strongest messages in the first two screenshots. Add a short caption text on a clean background into your screenshots and impress a positive impression in the viewers’ mind. Not so long ago app publishers had to upload screenshots of various sizes matching different iPhone models. Now it’s possible to upload screenshots for the screen of iPhone 7 Plus (1242 x 2208 pixels) and iOS App Store will adjust screenshots to sizes of all other iPhone generations automatically. To optimize your app screenshots, use this tool to checks your screenshots’ dimensions, count, orientations, and their compatibility with various iOS devices, and lets you know how to improve in the screenshot department. Making a video may be difficult but it can increase install rates by more than 23%, according to StoreMaven. Don’t forget to use a good poster frame (iOS)/feature graphic (Google Play). This graphic has a big impact as to whether your visitors would watch your video. Remember, 80% of users don’t watch past first 12 seconds of the video. It’s imperative you keep it concise and to the point. Avoid any fade-in and “welcome” type of message at the beginning of your video. In the app store search result page of iOS 11, up to three App Preview videos and/or screenshots can appear, rather than just two as in iOS 10. Videos will always be displayed before screenshots and the first video will now play automatically, but the sound will be muted by default. But how can you get more 5-star ratings for your app? You can do so by utilizing simple surveys or dialogs. Plus, remember to reply to the app reviews and feedback! Only the ones who care about your app will spend the time to leave a comment. Show them you care about them as well! This is a great way to let the visitors know that the developer is active too. For iOS App Store, you can also do this since the iOS 10.3 release in March 2017. But what should I do if I already have many bad reviews? Luckily, from iOS 11 onward, you can decide when to reset the average ratings and start over with a clean slate. Need some proof? This post from appfigures shows that ~98% of the top 100 free and ~62% of paid iOS and Android games can be downloaded are under 100 MB. You don’t think 150 MB is enough for your app? Take a look at Clash of Clans. Its iOS version is just 85.3 MB. Do you want to know how your app size compares to that of the top 100 apps? Use this App Store Optimization tool. It tells you whether your app size falls in the reasonable app size range of the top 100 apps. Statistics indicate a high correlation between high ratings and app update frequency. In fact, releasing regular updates has many benefits. It improves user loyalty and keeps an app top of mind because your app will show up in the updates list in the app stores. Apple and Google also like to see app updates because they show you’re committed to the app and that it’s still being maintained. Before doing a full localization of your whole app, consider localizing your app listing first. It means translating your app name, app store keywords, screenshots, etc. David Janner of MAKE APP Magazine conducted a localization experiment. In his experiment, he only localized the app name, the app store keywords, and sometimes the top line in the app description. After this simple localization, his app received a massive 767% increase in downloads. According to OneSky, only 31% of the world’s total app revenue came from the U.S., while 41% came from Asia, and 23% came from Europe. In particular, China has already surpassed the U.S. by both iOS app download and revenue. If your app only has an English version for the U.S. market, you are leaving a lot of money on the table. This app analytics tool predicts where your next successful markets are based on ARPU (Average Revenue Per User), Conversion Rates, and more. With this information, you can proactively localize your app to grasp the market opportunities. Track the number of impressions of your app preview, the number of app page visitors, and app installs. Identify the step where the most people leave. For example, are there more than 90% users who didn’t make it to the app page after seeing the app preview? Are there more than 50% users who didn’t install your app after seeing the app page? Once you have identified the step where people leave, make appropriate changes and see if any conversion improvements occur. Use this App Store Optimization tool to benchmark your app’s conversion rate (CR). It compares your download CR with your app category’s median and best CR, and tells you what you should do. Find out how to improve your conversion rates in this post about App Store SEO. Here is a cool infographic produced by Y Media Labs. It sums up the most important points about app store optimization. After you have published the changes, keep an eye on the app store keyword rankings. The app store keyword rankings change right after you published the new version. The target is to make all your app store keyword rankings reach at least top 10. If your new keywords are too hard to rank, you might have to replace them with another set of app store keywords. Repeat the three steps every three weeks or four because that’s roughly when big trends of app store keywords change. Don’t give up if the results of first few optimizations are not turning out well. App marketing takes time and app store optimization requires many observations to master. You’ve read to the end of this mega post (4,000+ words). Apple iOS 11 has arrived in all compatible devices on September 19, 2017. What should you do to get ready for iOS 11? How is iOS 11 going to affect your app store rankings? How about your app store optimization (ASO) strategy? You can use Artificial Intelligence to improve your app rankings in iOS 11 using this tool for free. Try to include a call-to-action in the subtitle. This can improve a tap-to-install conversion rate by 15-20% according to SplitMetrics. A short and catchy promo text can show an average 35% conversion lift. Use it to promote special offers, events and important updates, and use it as a description summary during the rest of time. Did you know you could use artificial intelligence to improve your app rankings in iOS 11 using this tool? The AI tool will find the best keyword suggestions for your app. It will also tell you how to improve your app product page to get more downloads. Check it out here. Yes, I know you heard this before. We all heard Chinese app store is super hot, but just how hot exactly it is? … and is it really worth investing your time and effort to publish your app/game there? As we predicted last year in this post, China is now the king of iOS mobile game revenue. Also, citing data from market research firm Newzoo, GMGC predicted that revenue from mobile games in China will reach US$7.7 billion in 2016, compared to US$7.3 billion in the US. For iOS mobile app downloads, China has already surpassed the U.S. and become the #1 country by iOS app downloads since Q1 2015. If we also take Android apps into consideration, Chinese app stores accounted for 59 percent of all app downloads in the whole wide world! Mobile game revenues are growing at an astonishing rate of 67 percent year-over-year. To put things in perspective, there are more mobile gamers in China than the total U.S. population according to Tech in Asia. “The fastest growth in mobile games is happening in China and the surrounding Southeast Asian market,” said Peter Warman, co-founder and chief executive of Newzoo. There’s no doubt, China is taking over the mobile world. This is a golden opportunity for western app developers, especially considering the general lack of creativity in China. So, it is not a question of why you should enter China, it is really a question of how. Check out the link below to find out how. Wanna ride on the big wave of the Chinese mobile market? As a frequent traveler in China, I could not always play the games I bought for my PC or PS4. I always had to keep several games installed on my iPhone to fix my craving. They are all foreign games in the Chinese app store. I am going to show you my current set of games on my phone today. I think many people should already know about The Room series. It’s a beautiful puzzle game which requires you to manipulate objects and shapes to unlock gadgets and chests. There’re occasional word puzzles, but those do not need Sherlock Holmes to solve. That is why the game can be popular in the Chinese app store because Chinese players can manage to play the game even if they are not very good at English. On Radiation Island, I have to defend myself from bears and zombies, solve puzzles, and survive the harsh weather and hunger. I would recommend this game to all survival game fans. I purchased Radiation Island as soon as I found the game in the App Store because there is no developer in China who makes survival game. A survival game of this high quality has a good chance of reaching the top. There are many top-down shooters in the Chinese App Store but Space Marshals’ my favorite. The game has the best eye-candy and deepest gameplay. The environment has very high details and the high-definition animation is really well-made. I enjoy how I have more than one way to complete my missions. I can gun down the enemies straight up like Terminator or I can assassinate the enemies silently like Solid Snake. There are also many weapons for me to choose from, and I had fun trying out different combos of weapons. As a dad of three daughters, I found the title Daddy was a Thief funny so I purchased it and gave it a try. The game is a simple, straightforward platformer game. I have to go downward along a tower, dodge the police, and grab as many coins as I can. The game only requires one thumb to play so it allows me to feed my daughters with a milk bottle with one hand and play this with my other hand. Punch Club is a really well-made simulation game with heavy RPG element. Since simulation game for male players is rare in the Chinese app store and martial art is popular in China, this game gets a good standing in the top app chart consistently. In Punch Club, you have to train your character, plan your skill tree, beat up random mofo’s, and win in tournaments. You also have to deliver pizza to make a living and eat the proper food to survive. There are many ways to climb to the top and it’s up to you to decide how you get there. Last but not least, I want to recommend Rival Kingdoms. This game is better than Clash of Clans in lots of ways. The 2D arts and UI animation in this game are stunning. The Ancients system, which allows you to choose your favorite set of magic to aid your battle, adds more unimaginable options to the battle. Also, I like how the game uses energy instead of requiring me to rebuild the units for the cooldown. This makes me feel much more comfortable sending the troops to battle without worrying how long I have waited to build the troops. P.S. Are you a mobile game developer? Check out the 3 Reasons Why You Should Launch Your Game In Chinese App Store now! Hey, everyone! This time, I will talk about four tips and tricks on how to do mobile marketing in China app market. Chinese advertisers and publishers are not familiar with western ad networks, so western ad networks (e.g. Google Adwords, Chartboost, and Tapjoy) are ineffective in China. The largest mobile ad networks in China are hosted by Tencent, Sina and Baidu, the owners of WeChat (China’s Facebook) and Weibo (China’s Twitter) and Baidu (China’s Google) respectively. These giant companies have monopolized the ad traffic in China, so you have to buy ads from them. In China, a whopping 91% of Chinese online users have social media accounts. This makes implementing both incentive and non-incentive social share in your app very effective in China. There won’t be any organic growth if the app does not connect to any social network because there’s no easy channel to get the words around. You have to integrate your apps with Tencent WeChat (China’s Facebook) and Sina Weibo (China’s Twitter) because Facebook and Twitter are prohibited in China app market. Chinese marketers have a habit of advertising their apps through sponsored tweets of Chinese celebrities or interest groups, aka Key Opinion Leaders, on WeChat (China’s Facebook) and Weibo (China’s Twitter). Imagine David Beckham posting a football manager game on his twitter. This is one of the most effective ways to get quality installs due to the loyalty of the fans. Social media marketing on WeChat and Weibo has become the core component of any China app marketing plans in China. However, doing social media marketing in China is actually very different from the other parts of the world. I wrote a separate post to talk about it. Check it out in this post “6 Social Media Hacks for Publishing Your Mobile App & Game in China“. I hope the tips above can give you some ideas of app marketing in the China app market. If you are interested in knowing more details, feel free to leave a comment below.